Which kind am I? Both, in fact. 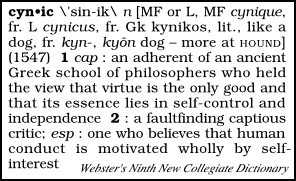 Think about it - the two definitions are not obviously contradictory, except that the the first sounds virtuous, and the second self-evidently base and unpleasant. Yet both are valid after their fashion, and while I try not to be superciliously captious, I do tend to believe that expecting people to follow their self-interest, as perceived, is a better guide to human behavior than any other model I have so far endeavored to investigate.